I've been familiar with the Denmark 72 set for some time, having played Scandinavian Nights to death (the video version, that is) and then having scored a copy of the soundtrack of the Japanese laserdisk which was much crisper and LOUDER than the video but had a couple of audio flaws in there too. So what we have here is the earliest official live recording of what was to form the core of the set until the demise of MkII. Kicking off with "Highway Star", I still love the bit where Gillan stops singing to chastise an overzealous bouncer-Wierd to think that, over 30 years later at both Plymouth and Birmingham on the September 2002 tour, he was still waggling his finger at security and TV cameras (and the band are still performing 5 of the 9 tracks on offer on this set), time really does stand still! Back to the actual music, well "Highway Star" has the slightly chaotic freshness that made the track such an exhilarating live tune. powered along on a wall of bass guitar and thundering drums and, before you know it, they're into "Strange Kind Of Woman", chugging along nicely. Apparently, they're "just doing the one tonight" according to Mr Gillan, so what's all that about then?! Next up, a stunning version of "Child In Time", and after spending so much time listening to recent bootlegs it's amazing to recall just how much more powerful Ian's voice was back then, his controlled articulation in the quiet parts as sublime as his pitched screams are, well, ridiculously upfront. Odd again, to lurch from the first chorus into a keyboard solo you can actually hear before Blackers takes over. I've always been an advocate of the Morse-era band, but listening to stuff like this serves to remind me why some consider that the subtlety of the keyboard work these days is buried beneath punishingly loud guitar/bass work. Here, though, Blackers backs off, just the bass maintaining a hypnotic rumble while Jon doodles over the top. Weighing in at nearly 17 and a half minutes, you get alot of music for your song here. I've not listened to anything much from `72 for quite some time and it's definitely goosebumps time as the volume gets rolled off to expose the delicate rhythm work and measured (rather than full on) approach of the protaganists. Before you know it, we're into Disc 2 and "Lazy" (one thing you can't accuse Jon of being during the intro), some truly marvellous, dischordant keyboard droning, a quick rock of the Hammond to set the Leslie speakers exploding and then it's into the familiar groove which has had me tapping my feet to the tune for the last 25 years, Ritchie sparring with Jon before the riff kicks in, tentatively picking away at the riff and teasing us before the band launch into the song proper, again shuffling along on the rhythm section. Spolit these days as we are by better mixing desks and live sound, Ian Paice's snare and bass drums sound like a cornflake box and tea chest respectively (as they do on pretty much all recordings from this era), but with no multitracks to work from, what can we possibly expect?! Jon really lets fly on his solo here, Roger going up and down the scale until he threatens to run out of frets before it's back into the main riff and Ian waggling a tambourine into the mic before finally ripping the harmonica passage. Magic. "Space Truckin" is another drawn out version, 24 minutes bits of Kachachurian's Sabre Dance (I think that's how you spell the name!) being crafted in, almost dropped in effortlessly, by Jon before things get taken down a notch for a few minutes of serious Strat abuse and general trem waggling. Possibly one of the best versions of the song I've heard, with the obvious bonus of the sound laying bare the more quiet parts of Ritchie and Jon's work which are normally inaudible or drowned out by moronic drunkards on boots of the era. So we get "Fireball" live by Mk II, too - faltering into the song with guitar problems, the track eventually picks up impetus and gets going properly in a full flurry again carried along by Roger's often underacknowledged bass work. The version itself is taken at a fair pace that leaves you thinking the band are on the verge of collapse, before winding down into "Lucille", again faster than the BBC In Concert version-Perhaps motivated by the "proper" live environment? An off-key "Black Night" (Blackmore's strat seems never to have quite recovered from th abuse of Space Truckin) finishes off the double CD set, the track being quite close to the made In Japan versions in structure and pace. Again, it's nice to hear this now after so much time concentrating on the live versions of the last few years. Packaging-wise, it follows the same broad style of previous Sonic Zoom releases, a good inner to read whilst your listening to the tracks and a bootleg-type "feel" to the packaging without it seeming cheap or shoddy-Just an ad on the cover from the original show for Purple at K.B.Hallen in Copenhagen. So, overall, well worth grabbing-Another great slice of Mk II and a pretty much essential addition to the catalogue. As it's only 9.30am, I'll raise my mug of coffee to Sonic Zoom for bringing this to my door..... Cheers! Purple Records' official "Sonic Zoom" series makes available live recordings of Deep Purple between 1968 and 1976 to the collector.The Deep Purple Appreciation Society is the official outlet through dpas online and their mail-order catalogue. DPAS members are also eligible for a discount. 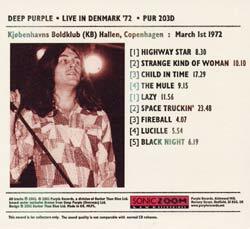 Deep Purple live at the KB Hallen, Copenhagen, March 1st 1972. Unlike some other recordings in the Sonic Zoom series, this one has not been in circulation amongst collectors throughout the last thirty years. The show was originally filmed by DR, Denmark's national radio and television station. The resulting black and white footage was never screened in full, and ended up lying dormant in the company's vaults. UK video release, as 'Scandinavian Nights, Live In Denmark' finally happened in 1990. 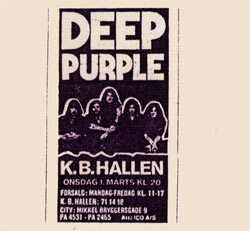 As far as is known it remains the only complete visual document of a Deep Purple mk2 concert. The VHS sound quality has always been a disappointment for reasons never fully explained. For this CD the sound has been taken direct from the original 1 inch video / audio reel, and is a huge improvement. The show is out on DVD in Japan, but was not taken from the original master.